Download "APPLICATION PROCESS FOR LAND DISTURBING PERMIT"
1 PREFACE: APPLICATION PROCESS FOR LAND DISTURBING PERMIT The property owner, developer and designated planners and engineers shall review the general development plans and detailed plans of the Local Issuing Authority that will affect the tract(s) to be developed and the area surrounding it. they shall review the Zoning Ordinance, Stormwater Management Ordinance, Subdivision Ordinance, Flood Damage Prevention Ordinance, the Soil Erosion and Sediment Control Ordinance and other ordinances which regulate the development of land within Bryan County. A. Best Management practices (BMPs) shall be required for all land-disturbing activities. BMPs must be properly designed to control soil erosion and sedimentation for all rainfall events up to and including a 25-year, 24 hour rainfall event. You are responsible for installing BMPs that will prevent sediment from moving beyond the boundaries of the property on which the project is located. (see attached) Failure to properly design, install or maintain BMPs shall constitute a violation of any land disturbing permit issued. B. If your project is one or more acres or is within 200 feet of state waters, you shall proceed with the following process: 1. 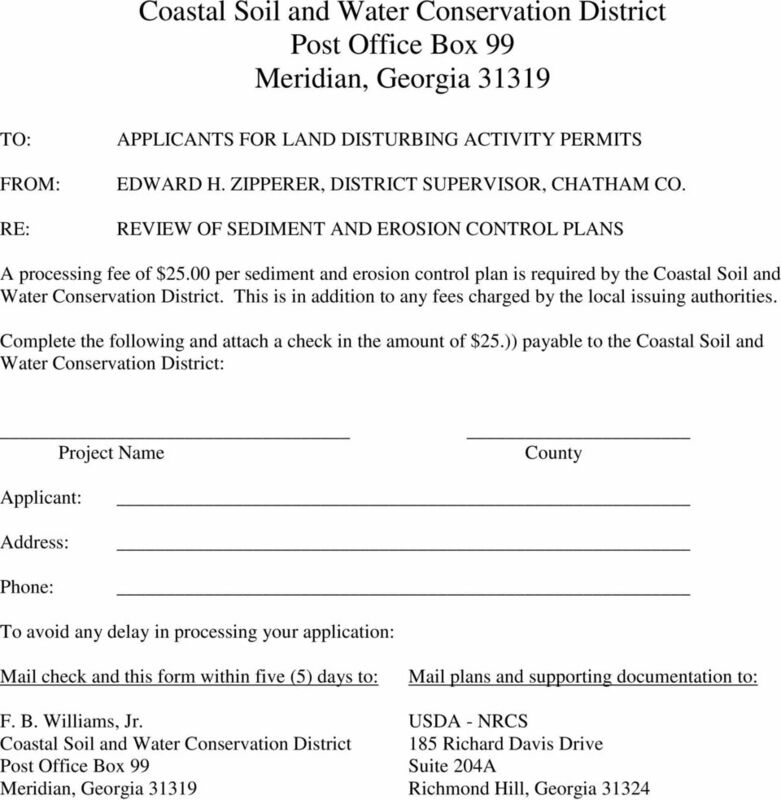 Two sets of Sediment and Erosion Control Plans should be submitted to the Natural Resources Conservation Service (NRCS) at the following address: USDA, Natural Resource Conservation Service 185 Richard Davis Drive, Suite, 204A Richmond Hill, Georgia A processing fee of $25.00 and the attached application shall be submitted to Coastal Soil and Water Conservation District at the following address: F. B. Williams, Jr. Coastal Soil and Water Conservation District Post Office Box 99 Meridian, Georgia Complete a Notice of Intent (NOI). 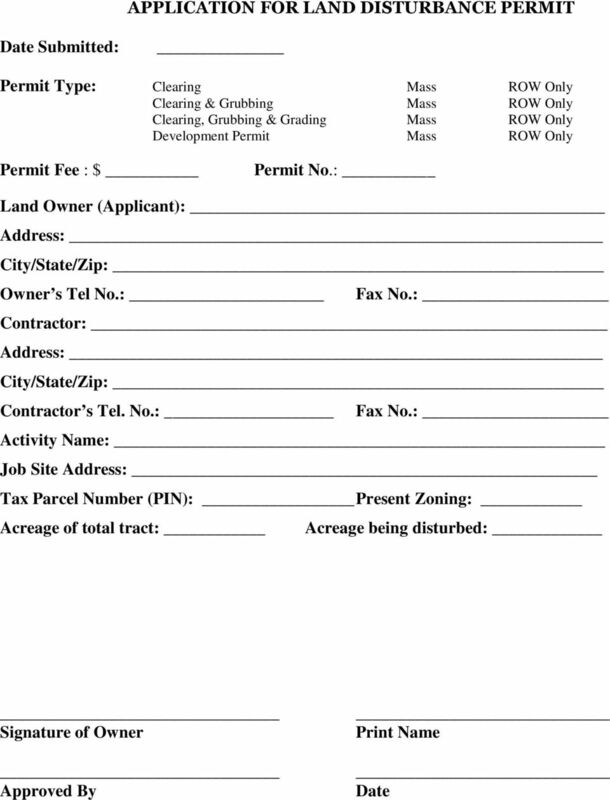 A copy of the forms can be found at Click EPD forms, then find Storm water (see example) 4. Submit the NOI to the following address: Coastal District-Brunswick Office Georgia Environmental Protection Division On Conservation Way Brunswick, Georgia (912) Submit General Permit Fee form and payment to: Environmental Protection Division Construction - Land Disturbing Fees Post Office Box Atlanta, Georgia Submit the following to the Bryan County Planning and Zoning Office: a. 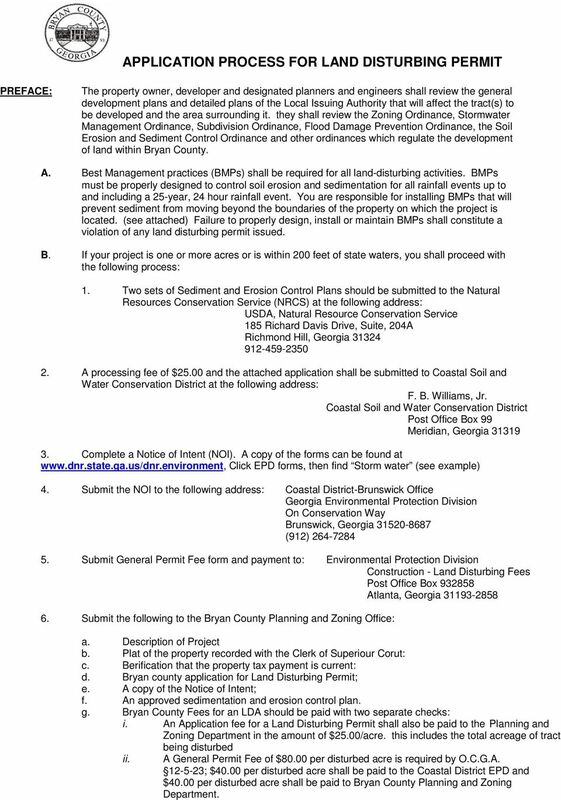 Description of Project b. Plat of the property recorded with the Clerk of Superiour Corut: c. Berification that the property tax payment is current: d. Bryan county application for Land Disturbing Permit; e. A copy of the Notice of Intent; f. An approved sedimentation and erosion control plan. g. Bryan County Fees for an LDA should be paid with two separate checks: i. An Application fee for a Land Disturbing Permit shall also be paid to the Planning and Zoning Department in the amount of $25.00/acre. this includes the total acreage of tract being disturbed ii. A General Permit Fee of $80.00 per disturbed acre is required by O.C.G.A ; $40.00 per disturbed acre shall be paid to the Coastal District EPD and $40.00 per disturbed acre shall be paid to Bryan County Planning and Zoning Department. 4 PLANNING AND ZONING DEPARTMENT!"#$$%&#! "'&&()* +,-./ / $ 1-% '&&(* 67$+,-./-0*213** 4./ EROSION AND SEDIMENT CONTROL CHECKLIST Project Description: Briefly describe the nature and purpose of the land disturbing activity, and the amount of grading involved. Existing site conditions: A description of the existing topography, vegetation and drainage. Adjacent areas: A description of the soils on the site giving such information as soil names, mapping unit, erodability, permeability, depth, texture and soil structure. Soils: A brief description of the soils on the site giving such information as soil names, mapping unit, erodability, permeability, depth, texture and soil structure. Critical Areas: A description of areas on the site. Construction Schedule: A graphical or narrative description of how construction phases will be timed. Erosion and Sediment Control Measures: A description of the methods which will be used to control erosion and sedimentation on the site. Permanent Stabilization: A brief description, including specifications, of how the site will be stabilized after construction is completed. Storm Water Management Considerations: Will the development of the site result in increased peak rates of runoff? Will this result in flooding or channel degradation downstream? If so, considerations should be given to storm water control structures on the site. Maintenance: A schedule of regular inspections and repair or erosion and sediment control structures should be set forth. Calculations: Any calculations made for the design of such items as sediment basins, diversions, waterways and calculations for runoff and storm water detention basin design (if applicable). Vicinity Map: A small map locating the site in relation to the surrounding area. Existing Contours: The existing contours of the site should be shown on a map. Existing Vegetation: The existing tree lines, grassy areas or unique vegetation should be shown on a map. Soils: The boundaries of the different soil types should be shown on a map. Indicate North: The direction of north in relation to the site should be shown. Critical Erosion Areas: Areas with potentially serious erosion problems should be shown on a map. Existing Drainage Patterns: The dividing lines and the direction of flow for the different drainage areas should be shown on a map. Final Contours: Changes to the existing contours should be shown on a map. Limits of Clearing and Grading: Areas which are to be cleared and graded should be outlined on a map. Location of Practices: The location of the erosion and sediment control and storm water management practices used on the site should be shown on a map using uniform coding symbols. 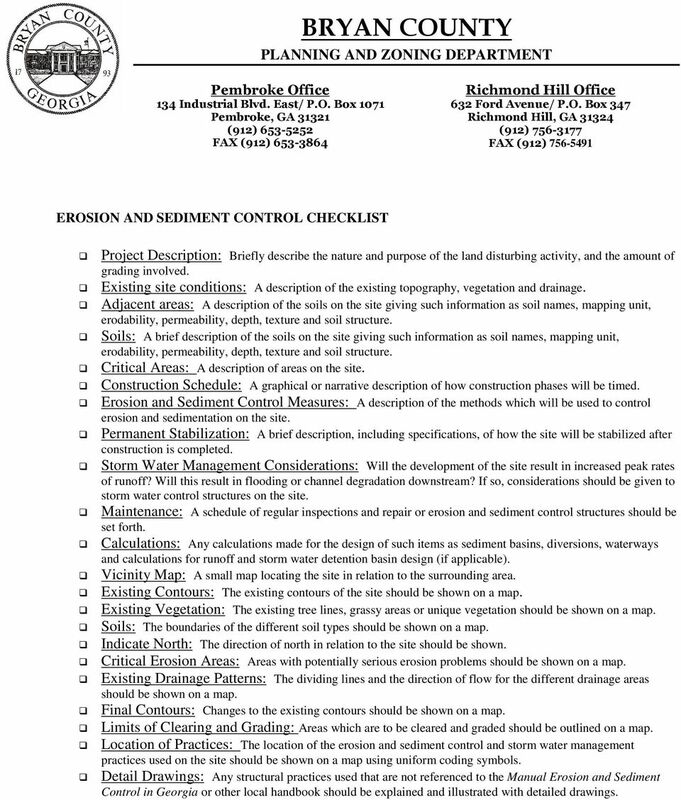 Detail Drawings: Any structural practices used that are not referenced to the Manual Erosion and Sediment Control in Georgia or other local handbook should be explained and illustrated with detailed drawings. 5 PLANNING AND ZONING DEPARTMENT!"#$$%&#! 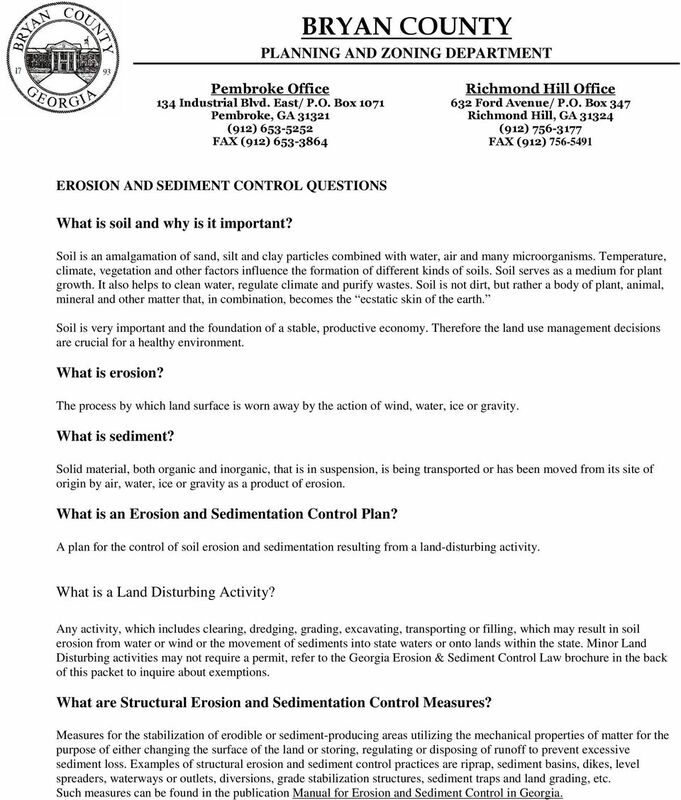 "'&&()* +,-./ / $ 1-% '&&(* 67$+,-./-0*213** 4./ EROSION AND SEDIMENT CONTROL QUESTIONS What is soil and why is it important? Soil is an amalgamation of sand, silt and clay particles combined with water, air and many microorganisms. Temperature, climate, vegetation and other factors influence the formation of different kinds of soils. Soil serves as a medium for plant growth. It also helps to clean water, regulate climate and purify wastes. Soil is not dirt, but rather a body of plant, animal, mineral and other matter that, in combination, becomes the ecstatic skin of the earth. Soil is very important and the foundation of a stable, productive economy. Therefore the land use management decisions are crucial for a healthy environment. What is erosion? The process by which land surface is worn away by the action of wind, water, ice or gravity. What is sediment? Solid material, both organic and inorganic, that is in suspension, is being transported or has been moved from its site of origin by air, water, ice or gravity as a product of erosion. What is an Erosion and Sedimentation Control Plan? A plan for the control of soil erosion and sedimentation resulting from a land-disturbing activity. What is a Land Disturbing Activity? Any activity, which includes clearing, dredging, grading, excavating, transporting or filling, which may result in soil erosion from water or wind or the movement of sediments into state waters or onto lands within the state. Minor Land Disturbing activities may not require a permit, refer to the Georgia Erosion & Sediment Control Law brochure in the back of this packet to inquire about exemptions. What are Structural Erosion and Sedimentation Control Measures? Measures for the stabilization of erodible or sediment-producing areas utilizing the mechanical properties of matter for the purpose of either changing the surface of the land or storing, regulating or disposing of runoff to prevent excessive sediment loss. Examples of structural erosion and sediment control practices are riprap, sediment basins, dikes, level spreaders, waterways or outlets, diversions, grade stabilization structures, sediment traps and land grading, etc. Such measures can be found in the publication Manual for Erosion and Sediment Control in Georgia. DIRECTIONS FOR ALL SITE, SUBDIVISION, AND LAND DISTURBING ACTIVITY PLANS SUBMITTED TO THE CITY OF NEWPORT NEWS. A. Describe the existing drainage patterns on-site as shown on Map I, including any potential flooding and erosion problems. BILL The Council President at the request of the County Executive. City of McDonough FINAL SUBDIVISION PLAT APPLICATION AND DEVELOPER CHECKLIST. Name of Subdivision: Location: No. of Acres: No.